Where are tax avoidance schemes based? International charity Oxfam has compiled a list of countries which it says allow companies to pay too little tax. Their new research looks at the various schemes run by governments to enable large corporations to avoid paying tax, such as low corporate tax rates and tax incentives. It has also looked at how well the country cooperates with international efforts against tax avoidance. These are its top 15 worst offenders. Four on the list are under the sovereignty of the UK, including the two worst offenders; Bermuda, in first place, and the Cayman Islands, in second. 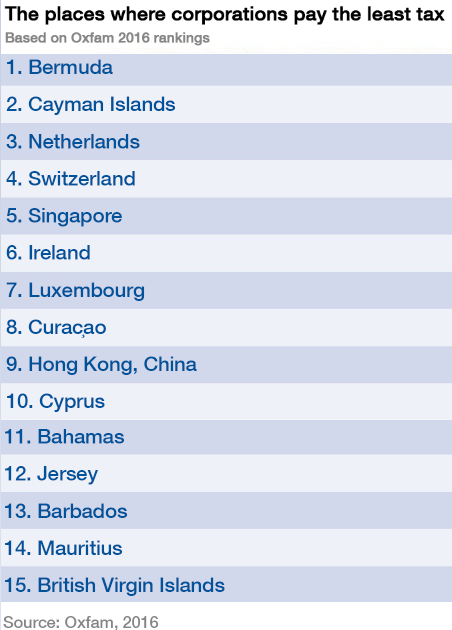 Further down is Jersey, in 12th place, and the British Virgin Islands in 15th place. Bermuda and the Cayman Islands top the list because they have 0% corporate income tax, 0% withholding taxes, and they don't participate in trying to clamp down on tax avoidance schemes. In addition, Oxfam found evidence of large-scale profit shifting – where the company makes a profit in one area and moves it to another with much more favourable tax schemes. This problem was on the agenda at Davos 2017, where Winnie Byanyima, the Executive Director of Oxfam, took part in a session on "taxation without borders". "We need to look at tax dodging in connection with rising inequality, said Byanyima. "Take a country like Kenya. It’s losing $1.1 billion every year through tax incentives. That’s double the health budget, in a country where one in four children die at birth." "The leak came which pointed out a global problem, it made us run faster than we were already running. Today there is not one issue pending in Panama’s steps to comply with the highest standards internationally." She also called for a global crackdown on "sweetener deals" to lure companies to a country with tax breaks. "What happens when multinationals go to developing countries to establish their operations? They insist on negotiating tax breaks, tax breaks that local companies don't have." 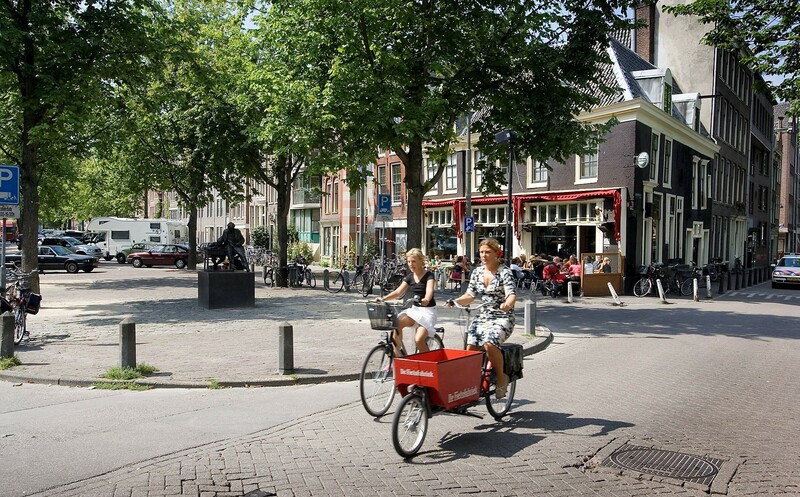 The Oxfam research revealed that some of the places where corporations can pay the least tax are countries with reasonable nominal corporate tax rates, including the Netherlands, Luxembourg, Singapore and Hong Kong. However, tax incentives lower how much the companies actually pay. Oxfam found that corporate tax rates are indeed going down; falling from an average of 27.5% just 10 years ago to 23.6% today. Meanwhile, over the last 30 years, net profits posted by the world’s largest companies more than tripled in real terms, from $2 trillion in 1980 to $7.2 trillion by 2013. This trend, the report says, has not been matched by a rise in corporate income tax contributions, and this is partly a result of tax incentives. Oxfam's analysis found that 90% of the world’s biggest companies had a presence in at least one tax haven. A key point that the report makes is that, although some world leaders, including the EU and the G20, are themselves compiling tax avoidance "blacklists", they use criteria which is not objective or comprehensive enough. For example, the EU is only looking at countries outside of the EU, which means that some of the countries on Oxfam's list would not be assessed. The list being compiled by the G20 focuses on financial transparency, says Oxfam, and ignores many key tax policies that facilitate corporate tax dodging including zero corporate tax rates. Oxfam's problem with corporations not paying full tax is that this is a key contributor to the inequality crisis. According to previous Oxfam research, just 62 people control the same wealth as the poorest 3.6 billion people. This sort of inequality is often blamed for undermining economic growth and the fight against poverty. "When corporations pay the right tax, it raises more income for national budgets, and when this revenue is invested in public services, it reduces inequality because it redistributes the income by putting ‘virtual income’ in the pockets of poor people. This equips people with the essential tools and skills to escape poverty, such as good health care and education." says the report. "When they don't, governments have to cut back on the essential spending needed to reduce inequality and poverty; or to make up the shortfall by levying higher taxes, such as value-added tax (VAT), on other, less wealthy sections of society," it adds. This matters more in poorer countries, says the report, because corporation tax makes up a higher proportion of taxes than in richer countries. The report estimates that developing countries lose around $100bn annually as a result of corporate tax avoidance schemes, enough to educate all of the 124 million children currently out of school, and to save the lives of six million children. Oxfam concludes that governments should launch a new generation of comprehensive international tax reforms, including making tax practices more transparent and stopping unfair and unproductive tax incentives. "Everyone must pay their fair share of taxes, and should not be allowed to escape their obligations to the societies in which they operate and where they generate their wealth," concludes the report.